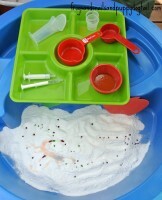 Simple science that doubles as sensory play is always a hit at my house. This simple setup for playtime got thumbs up from all of them. Monsters Inc Science is great for multiple ages and easy to get ready for the kids. My kids are 1yr, 3yr, and 5yr.